I really do love to pin! Nothing beats the custom-fit and comfort of a pinned prefold or flat diaper. 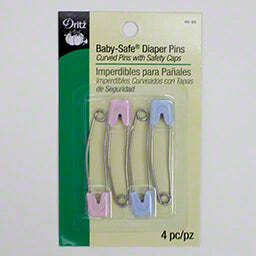 A pinned diaper is so classic, comfortable and adorable. Sharp pins slide through fabric more easily than blunt pins. Even in the same package, there are some variances in the sharpness of the points so it is good to have a few packages of pins on hand in case a random pin isn't quite as sharp as others. This is true with all brands of pins, from the cheap ones through to these top of the line Dritz pins, in our experience. Some are just better than others, even though they will all work ok. Lubricating pins by pushing the point into a bar of Ivory or other soap before using helps any pin slide, so do lubricate your pins. 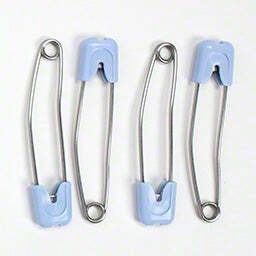 The stainless steel part of the pin needs to be sturdy enough not to bend when you slide them through fabric. These pins are both sharp and firm and without burrs. Good pins do make pinning a little easier. 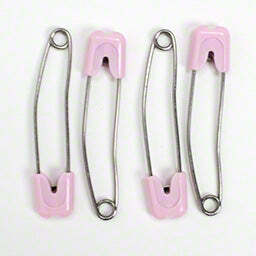 These are sturdier and stronger than the free pins. Do not buy painted metal head pins unless the seller can show you that they have been tested for lead paint and can show you the CPSIA compliance certification of their current stock of pins or just avoid painted metal for your safety and baby's safety. The 4-packs of light blue and light pink are open stock without packaging. The other colors are in packaging as pictured. 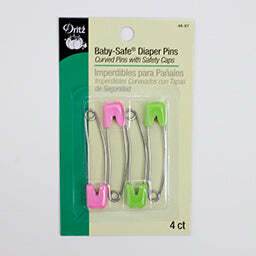 They have slide-lock baby-safe heads. 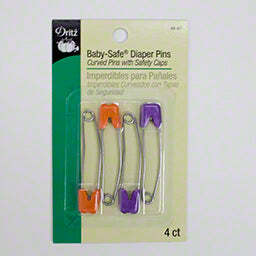 Always use a cover over diaper pins or other diaper fasteners. Made in Malaysia. I use these, the GMD pins, and the free pins I got from here. Of the three, the GMD pins are my favorite. They are sturdy, slanted, and have the pull top lock, which I love. Perfect for my active toddler. These Dritz pins are practically the same as the GMDs but with one drawback. They do generally need some sharpening before use. Only 1 of the 4 pins in my package didn't really need sharpening to easily slide through multi-layer fabric. But, with all of the color choices, I don't mind the little bit of extra work. Just sit down with the little strawberry on your pin cushion and mindlessly stab it (not yourself) while watching a show. Not too hard. That said, if you don't care about color choices, go with the GMDs. They are the better of the two. Or, if you are looking for really sharp pins that glide through fabric like butter and don't care about them easily bending, go with the free ones. Those work well too. Kind of disappointed in these. I really love the color options but they were super dull out of the package. The free ones I get with purchases are sharper right out of the package but I wanted the locking head ones. I'm going to order some white GMD ones. I sharpened these several times with my sharpener strawberry that hangs off my tomato pin cushion, it helped a little bit. I'm going to continue to try sharpening them though. I'm fairly disappointed in these. I'm fairly disappointed in these. I needed new pins as I've used the same ones through 2 babies for nearly 4 years now. And the ends of these new ones were so dull I couldn't get them through the fabric at all. I've always used the gmd lock head pins and they slide through so much easier then these. Not the quality I expected at all. I ended up trashing them since they were so blunt tipped. People have always raved about these are being high quality. Maybe I just got some not so great ones. Boo. GMD Response: Pins of any brand can be defective sometimes. Blunt tips can happen and that is a manufacturing defect which we will happily replace for you. Please use the Contact Us link and let us know of any product problem so we can take care of it for you. I'm sorry about the problem.